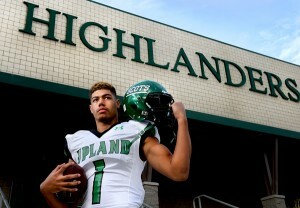 Seniors linebackers Josh Woods of Upland and Khaylan Thomas of Etiwanda have earned All-State recognition in Division I by MaxPreps. Woods was named to the MaxPreps first team. He was the Daily Bulletin All-Area Player of the Year, recording 92 tackles and 11 sacks. He also played on offensive, excelling at running back. Thomas managed 68 tackles, 2 interceptions and 2 fumble recoveries. He earned All-Inland Valley honors the last two years, also getting first team recognition as a junior. Both are future Pac-12 players with Woods due to sign with UCLA and Thomas planning to do so with Arizona State. This entry was posted in Josh Woods, Khaylan Thomas by Michelle Gardner. Bookmark the permalink.